Maria J. Kirby-Smith is primarily a figurative portrait sculptor, medallic to greater than life size, working in the lost wax method. Her goal is to capture the person's corporeal and intangible attributes - nuances of character and metaphysical traits. Smaller pieces are whimiscal, mythic-Greco Roman, anthropomorphic critters, and portraits that reveal more than the physical geography. I moved to the countryside so all can have paw, elbow and hock room. The studio is monitored by three cats. 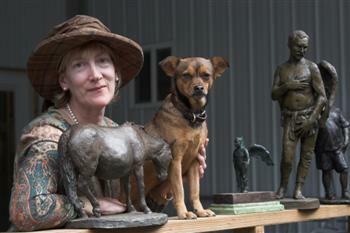 Photo: Sculptor with bodyguard Thrift Mae Pearl. Unfortunately my dear sweet body guard Thrift departed on November 10, 2018. I collect cat whiskers and thrive on dark chocolate. The most casual decisions and feather weight circumstances change our lives. A spontaneous detour from the interstate to view bronzes in the collection of an eccentric cousin in Blacksburg became an ephiphany. I longed to delineate the human form and forgot the stylistic differences of the hook motif of early to late Chou Dynasty bronzes. Shall draw the Thing as he sees It for the God of Things as They Are!"